This was a work by Andrés Jaque that involved the special participation of Alicia Rios. Other collaborators were Tania Álvarez, Carmen Ovejero, María-Solange Faría, Herminia Vegas. Alicia was invited to create a piece employing the Automatic Material designed by Andrés Jaque, a suit equipped with the keys to feeling at home in the contemporary city. It could be worn, or opened up and spread out on the ground. It contained a section of lawn, fabric that expanded to provide shelter and private space, its own lighting and even its own butane cylinder connected to a gas burner for cooking. Jaque explains that rather than thinking in terms of a suit, his objective was to create a role, that of a host or Techno-Geisha which, armed with the suit, could attend to the needs and desires of the inhabitants of the contemporary city. In the performance Alicia employed the suit in various ways, exploring its possible uses and especially the communication and relations that it facilitated with others. She became a hostess, offering others the opportunity to relax and feel at home in her hospitable island adrift in the modern urbis. Alicia has no human limits. 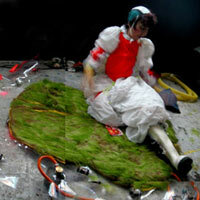 Her body blurs into an enveloping prosthesis which modifies the contexts she visits. The Improved-Alicia is the techno-host of the contemporary city. She supplies energy, softens surfaces, organises automatic picnics and opens bubbles of intimacy. While Alicia's participation in the project was only during its final phase, the work relates closely to Alicia's own. It was both multi-sensory and participatory. Although she dominated the space of the suit, as host she facilitated the public's experience of its pleasures, offering an afternoon picnic to all.